We live and breathe creative outdoor transformation ideas, and focus mainly on giving you what you want, be it adding a touch of nature using artificial grass, giving you a space to relax during sunny days, or spending quality time with your family while enjoying nature. Although we are in the business of selling patio covers, artificial grass, and landscaping services, but actually we sell dreams. A dream to have a perfect outdoor space, a dream to hold a coffee mug in a relaxing chair and read a book while enjoying nature, a dream to throwing amazing live barbeque party, and a dream to watch your kids engage in meaningful recreational activities. Whatever your outdoor lifestyle dream is, we can make it come true. Backyard Patio Covers leverages its years of experience in the industry; its team of highly qualified, experienced, and trained individuals; and its imaginative prowess to give our clients exactly what they want. Irrespective of the space you have or the idea you have in your mind, get connected with us and see for yourself how we will transform your patio. If you don’t know what you seek but want something truly remarkable then our landscape design experts will give you amazing ideas to choose from. When compared with natural grass, artificial grass has a lot more benefits. Artificial grass is easy to clean, looks and feels real, has no allergen, does not require mowing or digging, does not need maintenance, and remains beautiful all year long. Moreover, your pets and kids can play without getting any mud or dirt on them. Using artificial grass gives you your dream garden and peace of mind. You can enjoy and relax in your garden whenever you want. Backyard Patio Covers offers an impressive range of high quality artificial grass to give you an immaculate and natural outdoor space. Regardless of the weather outside, number of kids or pets in your home, or the available space, installing artificial grass in your patio will remain perfect, always. Tempted by the benefits of using artificial grass? Get connected with Backyard Patio Covers and get your garden/ lawn now. We have transformed different spaces including balconies, patios, or decking areas for hundreds of customers. How does insulation process work? We discuss your requirements first and then visit the site to give you an accurate quote. However, we do take into account your budget and the type of insulation your property needs, before giving you a quote so that you don’t have to worry about anything. 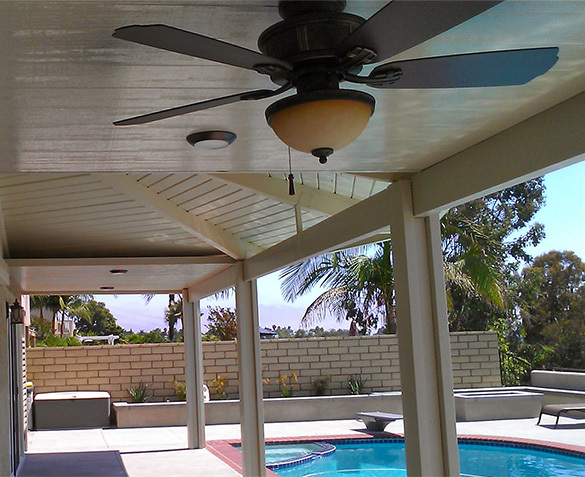 Backyard Patio Covers offers professional insulation services within your budget and as per your requirements. From installing high-density spray foam to fiberglass, our team of experts knows everything. Other than the benefits of insulation stated above, you should also know that getting your home insulated also helps protect the environment. Insulation reduces your carbon footprint by 12%, and 15% that consist of your use of electricity, and fossil fuels respectively. Moreover, insulation also produces positive effects on your health. But it is important to get your home properly insulated, which can only happen if you use the services of a professional team with years of experience like Backyard Patio Covers. Our landscape designers consider a range of objective qualities including orientation, site drainage, climate, human and vehicular access, construction blueprints and others before starting your landscape projects. Our team of experts focuses on your particular needs in accordance with your property’s landscape planning to ensure that landscape complements your overall construction details. From planning stages to final construction, our team of artists remain focused on your requirements. Landscape design is a journey that is not really that simple. It starts with an idea in your mind that Backyard Patio Covers turns into reality by creating a perfect balance of nature and culture. Our unique ability to turn our clients’ dreams into reality is what makes us different. Landscape design for us is an art and our team of artists take every job seriously. They measure every nook and corner of the available space, examine the environment, and then start building a landscape that reflects your style and the fineness of our services. Backyard Patio Covers’ team consists of people with unmetered imaginative capability, and passion to incredible landscapes.